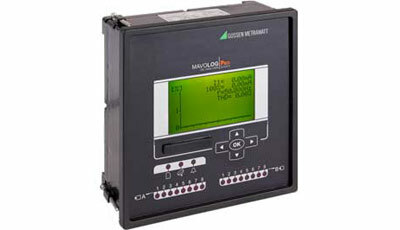 MAVOLOG PROGOSSEN METRAWATT is expanding its range of power disturbance analyzers with the new MAVOLOG PRO. It's used for continuous mains monitoring in accordance with mains quality standard EN50160. Rapid increases in the use of non-linear power consumers with non-sinusoidal current consumption are making themselves apparent in the form of mains pollution, which greatly impairs voltage quality. Missing or incomplete information regarding supply voltage quality may be the cause of inexplicable increases in energy costs, malfunctioning, production stoppages, standstills and power loss. The new MAVOLOG PRO power disturbance analyzer has been designed for continuous monitoring of the mains in accordance with mains quality standard EN50160. Highly flexible parameters configuration allows for adaptation to other standards, as well as for use in general power and consumption measurements. The instrument is capable of simultaneously logging and evaluating disturbances, as well as more than 140 quantities. The MAVOLOG PRO power disturbance analyzer is also equipped with analog as well as digital inputs and outputs to which sensors (e.g. temperature sensors, anemometers and pressure sensors) and I/O modules such as tariff meters can be connected. Thanks to the large auto-range for voltage, the instrument is not only suitable for low-voltage levels, but rather for medium and high-voltage as well via transformer. The sampling rate for current and voltage is 31.25 kHz per channel, and clock synchronization is implemented by means of GPS or the NTP standard. And this makes it a class A device in accordance with EN61000-4-30 (2011). If limit values are exceeded or an alarm is triggered, a report including important events is automatically generated and sent to the user/operator. Measurement data can be analyzed, documented and exported to CSV format as required with the help of free MAVO-View software. High-performance SQL database software is also available for larger mains monitoring systems with numerous measuring points.